Does anyone remember the “Wayne Gretzky Soup” made by Cambpell’s Soup during the 1996-97 season? 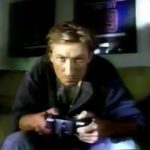 Yeah, seriously, Gretzky was on soup cans towards the end of his career. The picture to the right will prove this. Anyway, I have one final satirical clip to share from the 1997 NHL Awards, where they featured fake commercials or other humorous skits before and after commercial break. This last one is for more NHL player-inspired brands of soup.